All Franklin service advisors know that without the alternator, the battery will go dead in a few miles. So you can see the serpentine belt does a lot of work. And it if breaks, it affects a lot of systems. That's why your vehicle manufacturer and your service advisor at Franklin Auto Service have recommended that it be changed every so often so that it doesn't fail. Your friendly and knowledgeable Franklin Auto Service service advisor can perform a visual inspection of the belt to see if it has any cracks that signal the belt could fail soon and will measure the amount of belt material to make sure there is enough. 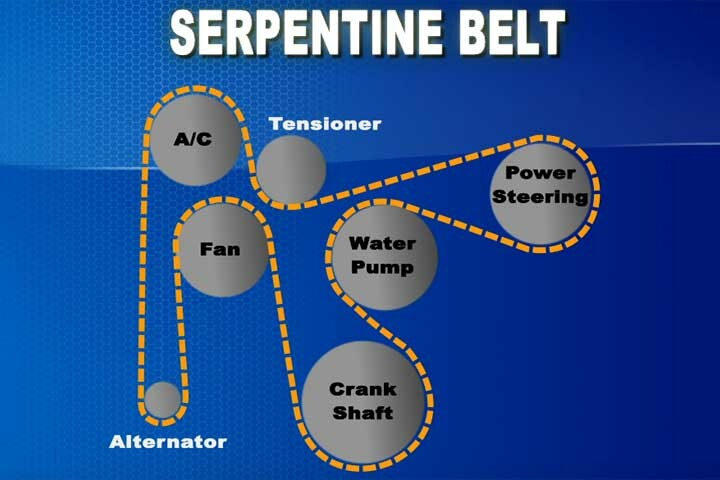 Your serpentine belt works in tandem with a spring loaded pulley attached to the engine called the tensioner pulley. Its job is to make sure there's a constant tension on the serpentine belt so that it doesn't slip. The spring can become worn and no longer provide the necessary pressure to keep the belt tight. At Franklin Auto Service in Franklin, we recommend that the tensioner be replaced at the same time as the serpentine belt.